Dual view sets new standards: for an unobstructed view in any situation, for more details see page 58. Available in 6 & 10 Ton capacities featuring an all weather comfort cab in Straight & Swivel Skipped models. See pages 58 & 59. The Ecosmart 12 provides canteen facilities for up to 6 persons, with a separate toilet, drying room and ample space to rest and eat. For more info see pages 160 &161. The buckle has a switch which is activated by the belt when fastened. This is connected to a green beacon on the vehicle to show that the operator is wearing a seat belt. 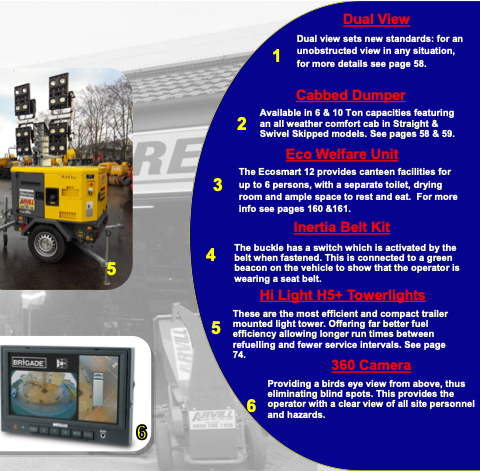 These are the most efficient and compact trailer mounted light tower. Offering far better fuel efficiency allowing longer run times between refuelling and fewer service intervals. See page 74. Providing a birds eye view from above, thus eliminating blind spots. This provides the operator with a clear view of all site personnel and hazards.